Fourth Row Center: Film Writings by Jason Bailey: On DVD: "Double Take"
Too often avant-garde or experimental cinema, for all of its value, fails on a basic level of engagement; somewhere it seems to be written that, these days anyway, we can’t have a good time at far-out movies. There are experimental filmmakers out there, yes, and they’re doing work that is groundbreaking and earnest and thumbs its nose at convention and pretention, but good God, some of it is just plain unwatchable. Well, Johan Grimonprez’s Double Take is, for all intents and purposes, an experimental movie—a weirdo assemblage of archival footage, marginally connected text, re-enactments of imagined events, and oddball flights of fancy. I’m still not quite sure how it all fits together, except as a free-form film essay on everything from Alfred Hitchcock, the Cold War, and doppelgangers to outer space, television, and coffee. But it is enthralling cinema. The subject is ostensibly Hitchcock, but he’s no more the primary topic than Orson Welles was in his similarly freewheeling F for Fake. A bit of a structure is provided by novelist Tom McCarthy, who wrote the film’s “story”—a fanciful tale (inspired by the short story “25 August, 1983” by Jorge Luis Borges) in which Hitch describes an incident in 1962 when he was called away from the set of The Birds for a phone call, and ended up meeting the 1980 version of himself. “They say that if you meet your double, you should kill him,” he notes. 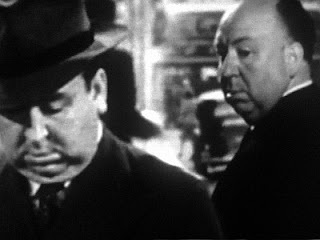 “Or he will kill you.” The notion of Hitchcock and his “double” is furthered by the film’s brilliant intercutting of his movie trailer and Alfred Hitchcock Presents TV appearances; gaps are filled in by vocal and physical doubles, but the film steps away from them to show us the impersonators at work. Running parallel to the Hitchcock story is a fragmented portrait of Cold War-era America—the space race, the Nixon-Kruschev “kitchen summit,” the Nixon-Kennedy debates, the Cuban missile crisis. The first response to all of this, for the viewer pulled in by the Hitchcock angle that the trailers and print materials have been pushing, is simple: What the hell does any of this have to do with Hitchcock? And then the answer comes, the deeper we get into the picture: everything. It’s all about context; we forget, watching his films as isolated pieces of pop art, that his work didn’t exist in a vacuum. By the late 1950s and early 1960s, he wasn’t just making fanciful potboilers anymore—there was a fear and paranoia in the air, and his best work tapped into that existential dread. In his hopscotch construction, director Grimonprez folds and twists McCarthy and Borges’s fictional (but plausible) tale into Hitch’s real career, and then into Hitch’s America. In doing that, he keeps plenty of plates spinning—I haven’t even mentioned the breaks for commercial “interruptions” (“Crime does not pay,” Hitchcock explains. “You must have a sponsor”). Grimonprez is both a literalist and an impressionist, in thrall to an abstract visual, the power of an odd cut, the jolt of a piece of old film (like the newsreel footage of the plane that flew into the Empire State building in 1945, and all of its worrisome allusions), the pleasure of an evocative music cue (Christian Halten’s score is augmented by some of the Bernard Hermann cues it so elegantly calls to mind). He’s an intellectual director, but still a sensual one. Double Take is an odd, playful, intriguing film, and while some of it is downright inexplicable, it never loses your interest. Grimonprez somehow manages to craft a film that works as an avant-garde trick, a historical documentary, and cinematic exploration, all at the same time, none at the expense of the other. I’m not sure how he did it; I’m not sure what compelled him to try. But the result is brilliant. "Double Take" is available now on DVD; it is also streaming on Netflix. For full A/V and bonus feature details, read this review on DVD Talk.